So there I was, heading out for a short walk around Theta Pond after a busy morning at work, when my friend and coworker Gina saw that I had my camera in hand and mentioned that she had a photo opportunity for me. She said there were some Mexican Verbena flowers near our building that I might want to check out with my close-up filters, so instead of going around the pond I took a detour to a little flower bed near the parking garage where I came across the flowers you see in this week’s picture. What Gina mentioned to me that made this opportunity a little more special was that when most people look at these particular flowers they see a single object, when in fact each large purple flower is actually made up of several very tiny flowers. It’s the kind of detail I would normally overlook (and have overlooked many times, since I walked past this particular bed of flowers often) but adds a whole new rich layer to what is already a beautiful sight. One other thing about this picture is the weird color cast. Look at how the greens in the top right corner are kind of desaturated and yellow-ish. I played around with tint and some other settings in Lightroom but in the end I think this is mostly just an artifact that happens when using close-up filters instead of a true macro lens. I could be wrong here, but when I use my +10 filter I find that I get strange coloring issues on my pictures sometimes. Maybe it has something to do with the way different wavelengths of light are bent and manipulated by the close-up filter, or maybe it’s all in my head. It is what it is though, and instead of trying to fix or change it I usually just settle on leaving the picture how it is and try to learn something for next time. The purple flower in the center is sharp, colorful, and really draws your attention which is what I was going for. And in that regard I think the photo worked out, so It’s all good. So thanks to Gina for pointing me in the direction of this flower, and to anyone reading this who is looking for something interesting to photograph…try walking outside your house or office and taking just a bit of a closer peed at the world around you. You might be surprised at what you find. Great Blog. Any time you have such a shallow depth of field, wind (even the slightest) will play havoc with the focus. I have also noticed within the last year or so, that a lot of flowers (sunflowers, poinsettias, etc) consist of a group of smaller flowers. I suspect that when we start looking closely at things, we see details we never noticed before–worlds within worlds. Ok that’s really interesting Dennis, and now I want to go out and see if I can notice this phenomenon more in the world around me. I don’t think I take enough time in my daily life to really examine things around me, especially flowers, and the more I do the more I realize how much more there is to it. As to the color cast, I see it as another plant in the background that is a different shade of green. 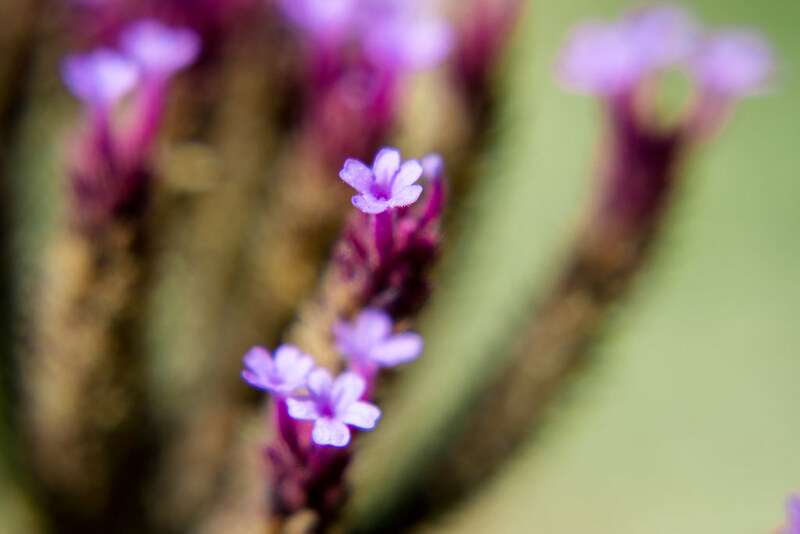 Verbena has such long thin stems that it probably is hard to keep them from moving. What would a faster shutter speed and increased ISO do for your shot?